With the Super Bowl, and all its build up finally over the next major date on the sporting calendar, the start of Spring Training notwithstanding, is the trade NHL trade deadline. While Sabres GM Tim Murray will undoubtedly be tasked with getting the best return for his tradeable assets before the deadline, the Sabres’ current performance on the ice has led fans and media alike to criticize Murray for his perceived lack of action during the franchise worst 14 game losing streak. While I’m going to steer clear of the tanking discussion at this particular time many people are of the viewpoint that if you’re not even changing anything in the middle of a 14 game losing streak you’re not trying to win. This is an opinion that is a difficult one to argue, but let’s take a look at the cards Tim Murray has to play. He could call up a player from Rochester, or send down an under-performing one. First off, it’s important to note that eight members of the Amerks have already suited up for the Sabres, and none have been particularly impressive. Veterans like Matt Ellis, high end prospects like Mikhail Grigrenko and Joel Armia, and those in between, like Johan Larsson, have all had an opportunity to show Ted Nolan they belong with the big club, and to this point all have failed to take advantage of the opportunity. The Amerks’ lone representative in the AHL all-star game was Phil Varone, who was also underwhelming during his time in the NHL; there’s not one player in Rochester who has made it clear they’re ready to make the jump to the big leagues. When it comes to sending people down the candidates are obvious, but it is more complicated that just shipping a guy down the thruway. There are currently ten players on the Sabres that will be unrestricted free agents come July 1, and are therefore ripe to be dealt before the trade deadline. When you think of those most deserving of a ticket to Rochester the names that come to mind will no doubt be Andre Benoit and Andrej Meszaros, and perhaps Cody Hodgson. Despite Buffalo’s struggles, immediate change may not be the recipe for success. The issue is that all three must clear waivers to get to Rochester. I’m going to go out on a limb and say that Tim Murray didn’t expect Meszaros and Benoit to be so inept when he signed them to one year deals before the year, but they could still net him a draft pick via trade. I’m sure he’s hoping that they find their game sometime in the next week or two so that he can squeeze a bit more out of a rival GM in a trade. If he tries to sneak one to Rochester the issue is twofold. First, their trade value is effectively nothing, and second there may be a GM willing to take a flyer on one of them and grab them on waivers, in which case Murray would lose a potential asset for nothing. In regards to Hodgson, if you send him down I think you’re effectively giving up on him. While is contract is terrible, he’s only 24 and may still be able to resurrect his career if he is used properly. The second option would be to make a trade. Tim Murray has not shown a propensity to sit on his hands when it comes to wheeling and dealing, but he’s also on record as saying the market is currently very, very quiet. The Sabres are one of only four or five true sellers as of now, so every other team knows they’re open for business, but it takes two to make a deal. As has been mentioned, the Sabres have a bevy of pending UFA’s, and thus the subject of rumors. The Sabres don’t currently have a pending UFA along the lines of Ryan Miller; they’re not getting a 1st and a roster player or prospect for the likes of Chris Stewart or Drew Stafford. While some, if not most, will probably be traded it makes sense for Murray for wait for the market to come to him. By waiting until the deadline or close to it he gives under-performing players like Benoit, Meszaros, or both goalies, to steady their game a bit and improve their trade value. Many people are of the belief that the time has come for Murray to start making trades focused on acquiring quality NHL players in exchange for one or two of the many prospects at the Sabres disposal. I’m totally on board with this, as I think the Sabres are quickly approaching having too many good prospects. While Tim Murray may also think along the same lines, he may be better served waiting until the draft or the offseason to make such a deal. By waiting until then, Murray should see more players available and more teams open to making such a deal because teams are less concerned about their salary cap situation in June or July rather than mid-season. When it comes to Tyler Myers there may not be much of a difference, in my opinion. Myers has plenty of term left on his current deal so his value should remain the same, and while there may be a few more teams to inquire come draft time if he were available, the two most talked about potential destinations (Anaheim and Detroit) have the ability to make a deal either now or in six months. 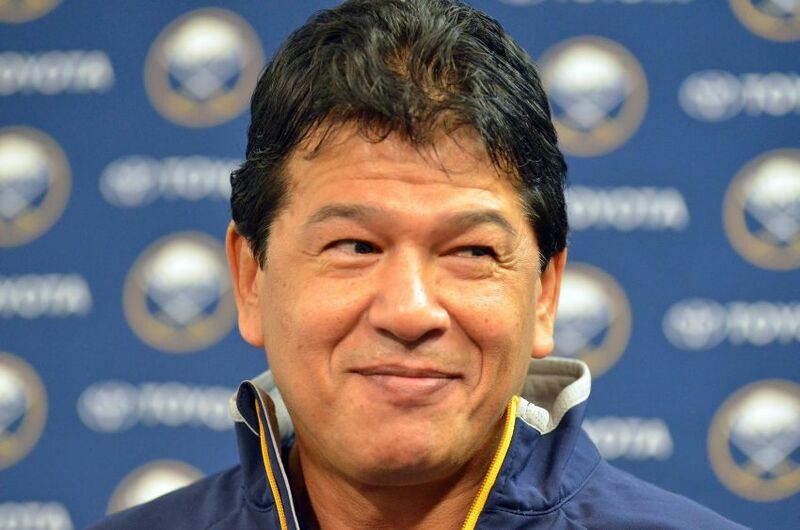 The other option is a move many teams would’ve made already; fire Ted Nolan. In the interest of full disclosure, I am not a huge supporter of Nolan, so don’t take what I’m about to say as me backing him. Everybody knows that Tim Murray didn’t hire Nolan, and I don’t believe Murray sees him as a long term solution behind the bench. That being said, he may be in a difficult spot when he comes to getting rid of him now. If Nolan were to be relieved of his duties, whoever is selected to replace him would be the Sabres’ fourth head coach since February of 2013; that doesn’t exactly scream “stable environment”. The bigger question would be who would take over for him? While I believe Nolan is a tactically weak head coach, he has the most coaching pedigree on the staff. Bryan Trottier had a hall of fame career as a player, but was out of the league for a decade prior to this year and lasted less than a year in his only other head coaching job (the Rangers). Danny Flynn is a friend of Nolan, so who knows if he sticks around if Nolan is kicked to the curb. Even if Flynn sticks around, it seems very doubtful that he’d be considered for the head coaching job beyond the end of this season. Tom Coolen is another friend of Nolan’s from the Latvian national team, and is currently in his first year coaching professionally in North America. Like Flynn, his prospects beyond this season with the Sabres organization seem bleak should Nolan be fired. None of the three jump off the page to me. The only other option would be to summon Chadd Cassidy, who will celebrate his two year anniversary behind the Amerks’ bench in a few weeks. It has yet to be seen if Murray believes Cassidy is ready to make the jump to the NHL, if even for a month or two; in my opinion if he thought Cassidy was ready he’d already be here. By waiting until the end of the season to make a move Murray would be able to select the coach he prefers from a wider pool of candidates, as other coaches are bound to see pink slips by the end of June. Since Tim Murray took over as GM he has not hesitated to make moves via the waiver wire, trade, or free agency. While I totally agree it is tough to imagine how a general manager can appear to be idly sitting in the press box watching team sink to new lows, when you look deeper into the possible actions to take you see it is not so black and white. If the roster is still basically status quo and the coaching staff is still in place come the end of June I’ll be the first to rally the troops in the name of change, but until then it may be best to take a breath and see how things unfold for a few months.